I know I have been a smidge absent lately, but I am gearing up for some intense postage, yes, that is correct - I am going to give another go at The 31 Day Nail Art Challenge. I have tried a few times over the past year, and if my memory serves me correctly.. I don't think I have ever successfully completed it. 2014 is my year! At least that is the mind set I am going with. I am quite looking forward to it this time.. also.. I am trying to be super organized as September is going to be a very busy month -- increase in work hours, a couple weddings (a few? there is 3.. 2 on the same day) and I am sure some party activities in there as well. Phew. It will all be worth it! And, like I said, I am trying to be organized - I have been doing some drawings to give me ideas for the actual days. Yay! If you're interested in doing it as well, or just want to scope the layout, check out the photo. I know for sure Chalkboard Nails is doing it, and probably a wealth of others! 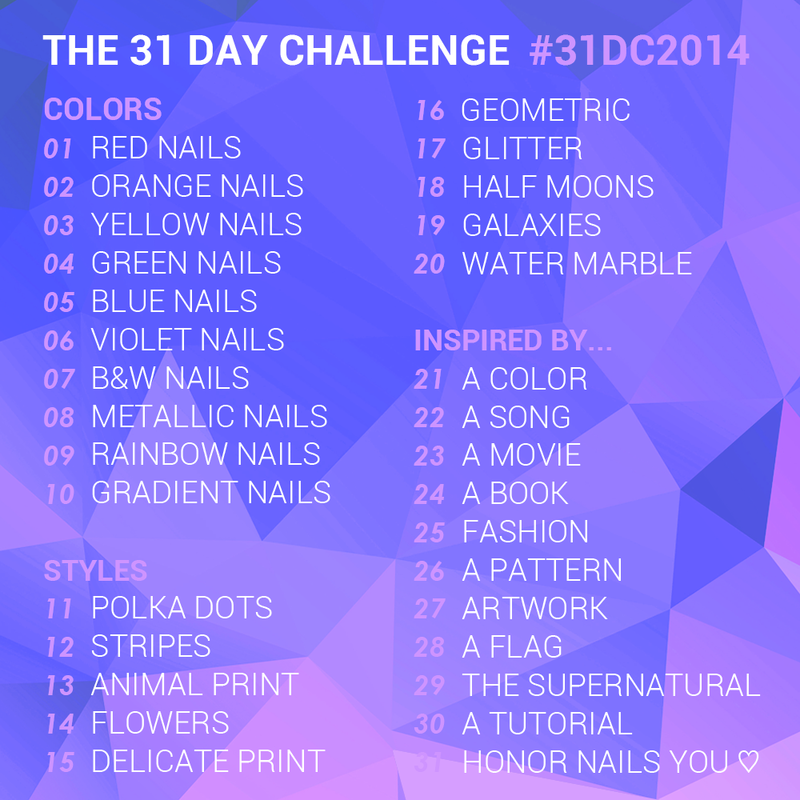 Make sure to check around using the hashtag #31DC2014. I am even going to try and keep my postings on instagram as well. I was having a convo with my parents about my blog the other day - I told them I really lack in my social media-ing, and I plan to amp that up. Wish me luck? Start checking back on September 1st! There is one post I would like to get up before the madness starts.. but I still have to create the nail look.. it is something kind of rad! Ok.. we shall see if I can squeeze it in in the next couple of days.